There is nothing like six pairs of chucks on the floor. I wanted a pair and one summer my mom told my oldest brother to take me to the store to get sneakers for school. I was glad he took me because mom always brought me some other brand. 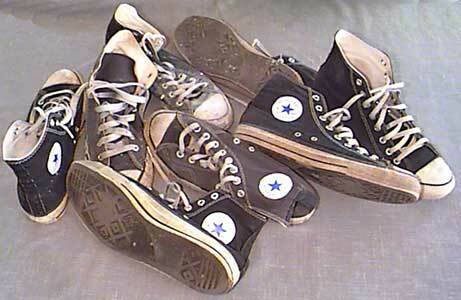 I remember looking in the sporting goods store and seeing the black chucks. My brother said it was time I got a real pair of sneakers. I remember the smell of new chucks, same as now. Man, I was so happy — my own black high tops like my brothers. I went one step further and had black and white laces together like my black friend Larry. My mom was about to faint at the sight of me at 11 years old in black high top sneakers and shorts — she was mad as hell. She accused my brother of making me another monster (She referred to my other brothers as monsters). But when my brothers saw me — man it was like I was now one of the boys. I had chucks just like them. Now a sixth pair of high top chucks were left on the bedroom floor. and is an amateur boxer through a local boxing club. two professional fights, winning both.